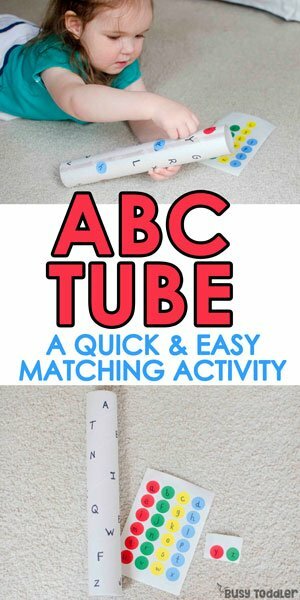 Grab an empty tube for a easy letter matching activity! My name is Susie and I’m addicted to dot stickers. Actually, it’s me AND my two year old who are addicted so at least I’m not alone here. Dot stickers are our jam. 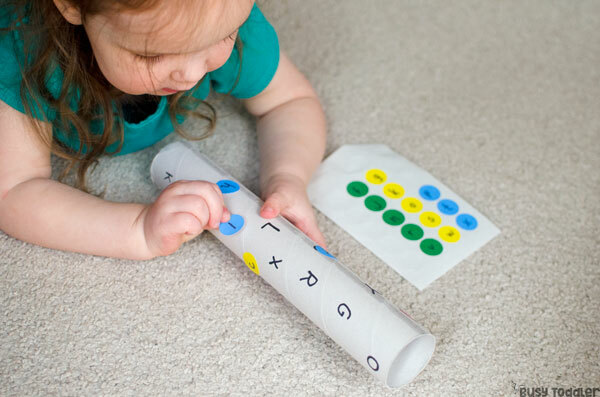 We love using them in any activity we can think of, from sorting to name recognition to board game building (no joke! We used them to make a board game once!). 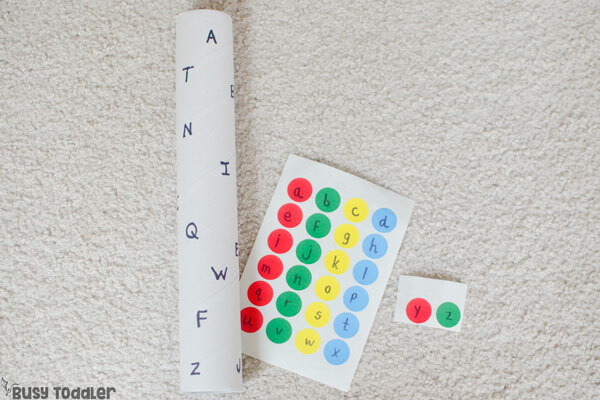 So grab your dot stickers – here’s one easy letter matching activity! I saw a version of this activity on Pinterest from Testy Yet Trying and knew we had to give it a go. 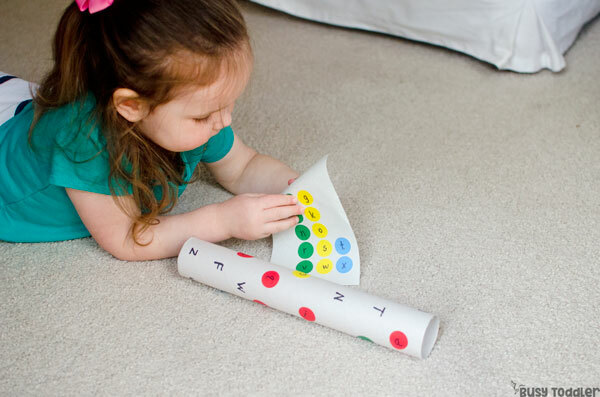 We are too into dot stickers not to try it! 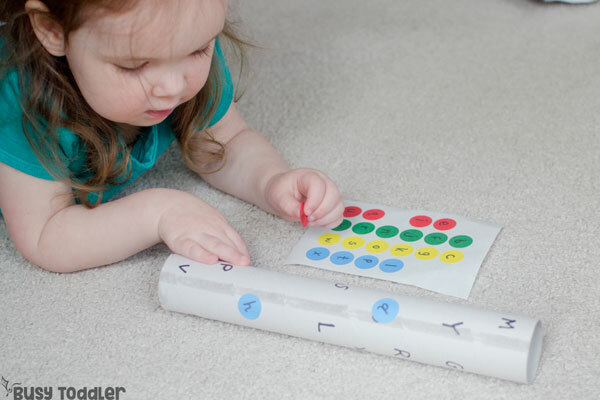 You don’t need much for this easy letter matching activity! This was one of those magical quick, low-prep activities that I live for. 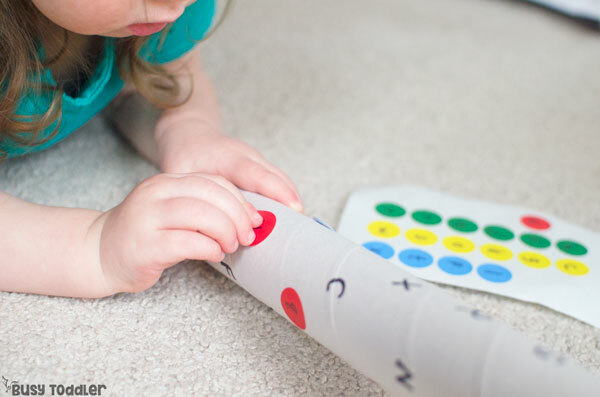 Toddler activities don’t need to be lots of prep and high stress. Quick and easy is where it’s at. And this activity totally fit the bill. 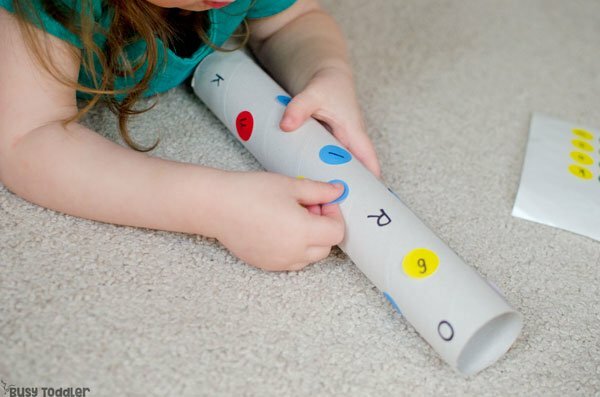 I grabbed an empty paper towel tube (one that I’d probably been saving for weeks…) and started to write the letters of the alphabet on it. I wrote the letters in upper case form on the tube. Then I had an idea for making this activity a little more challenging…. On the sticker sheet, I wrote all the letters again but this time, I wrote them in lower case form. The perfect challenge for my daughter! Having to match upper and lower case letters was the perfect added challenge for my daughter (29 months old). She had to really think when it came to some of those tricky letters like Jj and Gg. During an activity like this, I stay close to my daughter to make sure she’s “getting it”. I don’t intervene much, but I do listen to her as she works through the activity to make sure she’s correctly matching the letters. I don’t do this because I want her to be perfect. 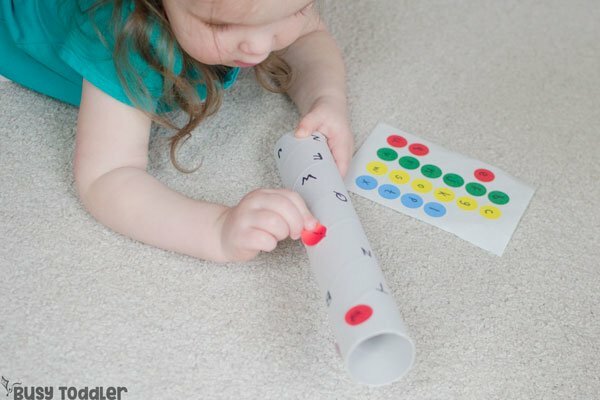 I do this because I want to make sure that she is practicing putting the correct letters together. I’ve noticed she reverses Jj and Ii a lot. I know this because I listen so I make sure to provide assistance when she matches up the wrong letter. It’s all about helping her learn, using these as “teachable moments”, and remembering in my Mom brain that when I see Jj or Ii out in the real world, to show them to her so that eventually, she commits them to memory. Nothing to stress about, no big deal. This activity was PERFECT for my daughter. Makes me wish I had more paper towel tubes so I could make a whole set of them like And Next Comes L did. 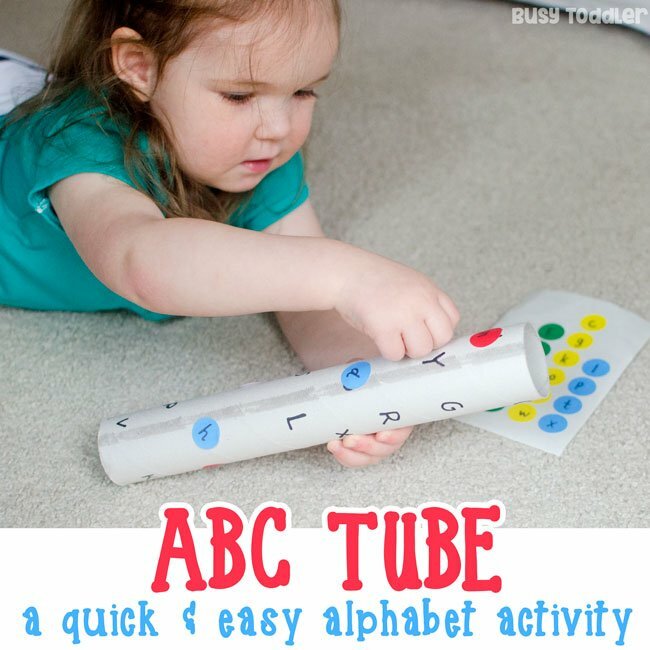 Will you make an ABC Tube?